Indulge in elegance with easy access to the excitement of the city at New York Marriott East Side. 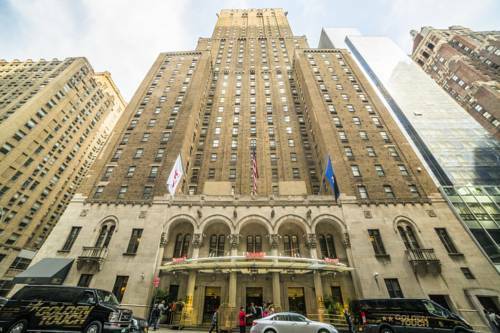 Explore the grandeur of Midtown Manhattan from our east side hotel by exploring attractions like the Chrysler Building. You can also take advantage of all of the shopping surrounding our hotel near Grand Central Station. Relax in style in our luxury guest rooms and suites, many with city views, spacious marble bathrooms, bathrobes and comfortable bedding with cotton-rich linens and down comforters. Internet TV allows you to stream your favorite shows, movies and music in each of the guest quarters. During downtime, get your workout routine knocked out in our fitness center. 525LEX Restaurant & Lounge offers a seasonal menu for dinner, while Illy Cafe is open for breakfast with freshly brewed coffee and pastries. Plan a social event or your dream wedding in one or more of our 20 event rooms. Whether visiting on business or vacation, luxury is waiting for you at New York Marriott East Side. Indulge in creative comfort cuisine and handcrafted cocktails at 525LEX, one of the premier restaurants in Midtown East. Our seasonal menu features an array of locally sourced meats, produce and cheeses. Located on the lobby level, our illy Caf coffee bar is available daily for your morning pick-me-up. Featuring fresh-brewed coffee and made to order expresso drinks, as well as muffins, pastries, yogurts, and other to go items.